Work on creating the new modern sports and community pavilion started earlier today (Monday, 3 December) which will see Horsewell Lane, Wigston get a much anticipated purpose-built facility. A ‘Ground Breaking’ event to mark the beginning of construction work took place and was attended by appointed contractors Derby-based G.F. Tomlinson’s, representatives from current and future pavilion tenants, Councillors, senior council staff and local residents. The rain didn’t stop play as amongst refreshments and exciting discussions for future pavilion use the assembled group witnessed the landmark first piece of turf being disturbed, which symbolises the beginning of a new chapter in Horsewell Lane’s history . 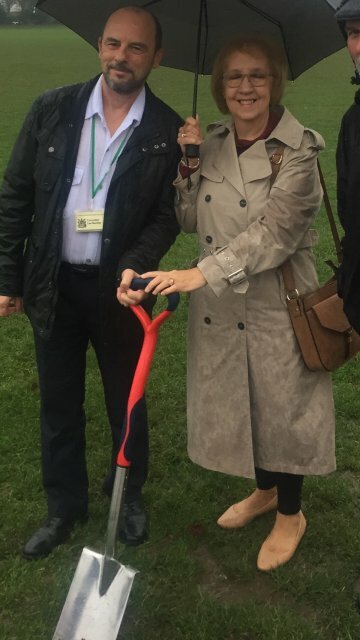 Oadby & Wigston Borough Councillor Lee Bentley, who has been a long-time champion of the project had the honour of ceremonial spade-wielding duties. Thanks to Oadby & Wigston Borough Council’s £1m investment the new building will provide modern changing facilities for local sports clubs, a nursery for pre-school plus a new meeting room and main hall which will be available to hire. The pavilion will be larger than the existing building and the scheme will include improved parking provision. The new building will be open in the summer of next year. Future pavilion occupants in attendance included staff from the Little Fishes Nursery, representatives from the Wigston Club for Young People, Wigston Forum, Wigston Tennis Club and Wigston Foxes football team. “It’s great to be here with all the people that have helped to make this project come about. “I would like to welcome our contractors G. F. Tomlinson and look forward to working with them on this project, it is very rewarding to see work actually starting on a scheme that a lot of local stakeholders have pushed for over a number of years, 20 plus actually.